Our interactive online training / eLearning courses have been developed by experts and are CPD certified. We can offer single courses to individual users, or a corporate solution using our LMS (Learner Management System) which allows multiple users. There is the option to customise your home page with your own company logo and corporate identity etc. We offer a range of licence options form single users to corporate SCROM compliant Learning Management Systems that can be rebranded with your company logo. Our online learning solutions are ‘cost effective’ with a focus on easy deployment hence the diversity of our clients ranging from major corporations, down to SMEs. This list includes, Government bodies, from Local Councils to main Government itself, along with Educational sectors including Universities and LEAs. 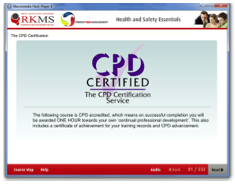 RKMS can provide you with a complete training system, whether it is web or intranet based. Each one of our online packages can be tailored to your exact requirements. To find out more about each course click on the following titles…. All courses are CPD certified offering you and your trainees that extra reward for their commitment towards ‘continual personal development’ All courses are developed to meet the criteria as set out by the HSE. All courses £25.00 per user* (excluding flagship HSE essentials). £99.00 for 5 users (£20 pp per course) larger discounts available for volume or corporate users call 0844 815 7765 for a tailored price.